Welcome to Bob's World Wide Web Server. Here is my photo album. I have just started putting pictures in there. How to mail to me. Put your email in an envelope. Encrypted E-mail is preferred. Use of GNU Privacy Guard is encouraged. Here is my public key for GPG key. Here are my older keys available for legacy reasons. I love to fly. The other folks I work with are sick of hearing about it. I like to fly taildraggers, a real pilot's airplane. I will also share my pictures of my airplane. I am a partner in a 1978 Cessna Hawk XP. This is a good solid airplane. I am in instrument rated, commercial pilot. I first learned to fly in gliders. A good online book about flying is available by John S. Denker called "See How It Flies" at http://www.av8n.com/how/. I am a ham radio operator. The FCC issued me KF0UW as my ham radio callsign, unique in the world. You will find me on the radio either on 145.77 using the all digital packet mode or on 145.115 NBFM voice. 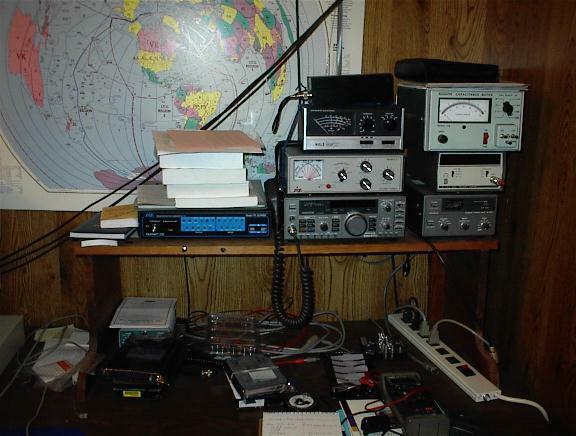 I am also an frequent visitor to 40m CW. Check out the Colorado Amateur Radio at http://www.rmsd.com/hamradio/hamradio.html and the American Radio Relay League at http://www.arrl.org/ home pages. I recently took a picture of the ham shack. It is not very exciting. I like to play Go. Drop by for a game if you are also a Go player. The local group likes to get together and play casual games at the Starry Night Coffee Shop in Fort Collins. I have been taking some time off from that but hope to be returning soon. I play at about the 8 kyu level and am hopefully improving. Check out the American Go Association web page. I have gone overboard with my home network. I have some pictures of the basement computer network if you care to peek. This is a frequent place for a few of us to gather for lan games. I am a big proponent of Free Speech software. I mother over and moderate the mailing lists for the GNU coreutils of fileutils, shelutils, and textutils. I also wrote and maintain the GNU coreutils FAQ. I have become a proponent of Debian GNU/Linux. Debian is a high quality operating system and is the backbone of the infrastructure at this site.